In a wider range of earthy tones than expected, sprinkled with brightly colored motifs, the designer decided to talk about spirited sophistication, eclectic sensuality, reinvented tradition, rewritten history, and the mix & match essence of having fun expressing ourselves! Custo Barcelona presented the FW15 collection titled Shake Before Use at the Mercedes-Benz New York Fashion Week to a loyal fashion-savvy audience at Lincoln Center. His stylish cocktail of folk, naturalism, and urban attitude proved to be an instant hit! 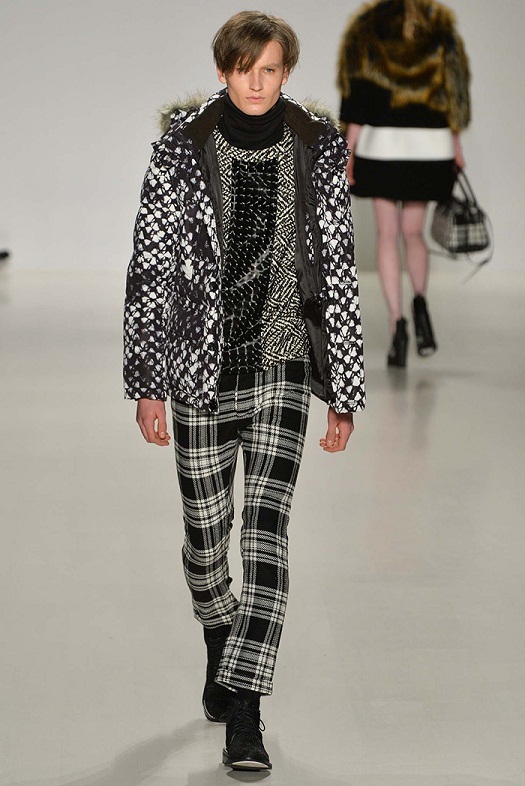 The collection showcased dresses and coats in traditional black and white plaid layered over metallic silk and lame blouses to create a contrast of traditional and experimental silhouettes on the runway. The women’s silhouettes adorned in wool skirts with godets, pleats, and wide sleeves inspired by origami. Oversized wool mohair coats, both long and straight, complement these looks; similar to the capes that cover the shoulders with an extensive geometry created with jacquards. The dresses, created from hatches of different textures take special importance. The Fall/Winter 2015 collection seeks to harmonize the black and white traditional tartan with ethnic influences including Aztec designs on full-length capes over short dresses with strong tribal details. A splash of brighter colors in fuchsia and petrol blue combined with the neutral color palette give the signature energy to it. The wool matte textures perfectly match with the brightness of the lamé, creating an interesting dialogue. The traditional long coats and capes hide a secret underneath: the presence of the light, silk dresses with an experimental cut. 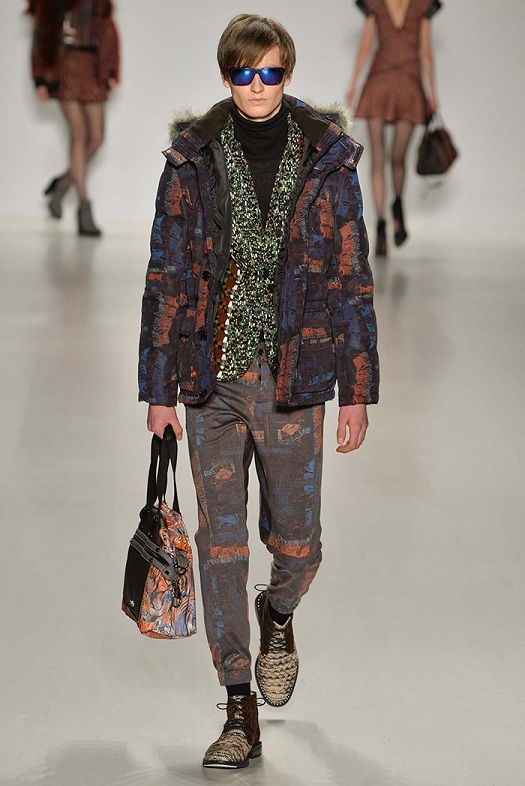 Custo designed this collection with a highlight in the uomo line. The collection expresses a classic language inspired by the era of silent movies. The functional coats, American jackets, suits, and jerseys combine both typical winter colors and those of a riskier nature. The traditional elements speak to a wider audience of women and men, while the signature elements of Custo Barcelona continue to appeal to a more daring audience. What an interesting blend with unpredictable details! Can’t wait to wear the various tartans in boots, jackets, tops and bottoms, as well as the cozy oversize coats in the role of a ‘chic, statement blanket’, that any fashionable girl will be rocking day-to-night!